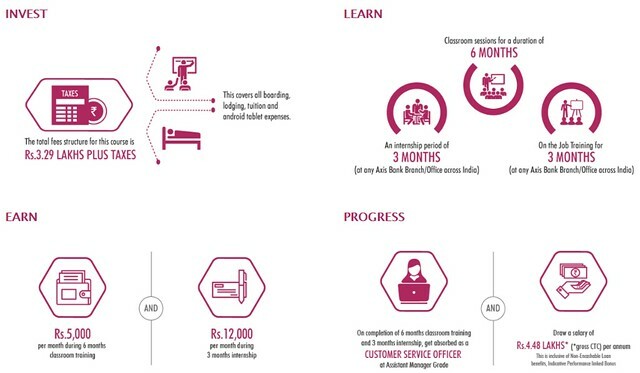 Axis Bank Young Bankers Program is a 1-year full-time residential program leading to Post Graduate Diploma in Banking (PGDBS) Services. The candidate who qualifies the online entrance exam and opts for the program will get an assured placement with Axis Bank as an Assistant Manager. The students who have completed their graduation in any stream or are in the final year of their studies can apply for Axis Bank Young Bankers (ABYB) Program. It is a one year programme. The Young Banker Program is 12 months, which includes nine months of classroom sessions and 3 months of Internship at any branch/office of Axis Bank. The Program is offered at Manipal Global Education in Bangalore and Amity Global Business School in Noida. It is a fully residential program. Class timings are 9 a.m. to 6 p.m.
Fee for the entire program is Rs. 3,92,000 payable term wise and there is no service bond to be signed by the candidates. For the August batch, the fee is Rs. 4,13,000. There are guaranteed job placement and probation of 6 months. Students are paid a monthly stipend of Rs.5000 during their on-campus classroom sessions and Rs.12000 per month is paid to them during the period of internship. On successful completion of the program, the students will be appointed as Front Desk Officer at Assistant Manager Grade at gross CTC of Rs. 4.48 Lakh. Demonstrate a systematic understanding of banking concepts and systems. Gain critical awareness of current challenges and new trends in the banking Industry. Demonstrate an ability to communicate effectively in business situations. Demonstrate a practical understanding of banking procedures and practices and successfully apply it to real-life business situations. The students will be provided with a medical insurance cover of Rs.1,00,000 during their period of study. Nationality: The program is open for national of India only. Age: The candidates must be minimum 21 years and maximum 30 years i.e. born on or after 1 April 1989. Academic Qualification: The applicant must have completed graduation from any stream or should be in the final year of the graduation. Minimum Qualifying Marks: The student must have scored minimum 50% marks in the final year of their graduation OR an aggregate of 50% & above in all years of graduation. Post Graduate Students not eligible. Students pursuing graduation not eligible. Application Form: The application process is completely online, and the formalities related to the application need to be completed on the myAMCAT's dedicated page for Axis Bank's Young Banker Program. Details Required: Candidates need to enter their personal information such as name, father’s name, address, contact number, e-mail id, details of educational qualification and other information to complete the application process. Payment of Application Fee: Candidates need to make a payment of Rs.500 by means of a demand draft, cash or net banking mode at any branch of Axis Bank. Application Confirmation: Once the application process is complete and the application fee has been successfully deposited, candidates will receive emails. The first email will have the information related to the myAMCAT user id and password. The second email will be the confirmation email for the receipt of the application fee. Documents required: The applicants need to upload their Graduation final year mark sheet/ Exam Hall Ticket to complete the application process. Format: .jpg or .bmp or .jpeg or pdf. 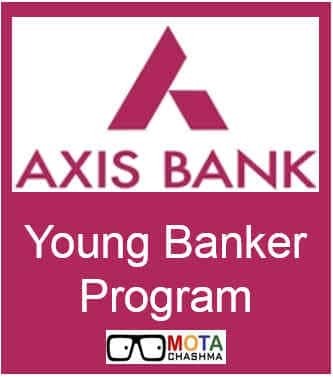 The candidates who want to apply for the Axis Bank Young Banker Program can apply only through online mode on the official website of Axis Bank at www.axisbank.com. The candidates have not to send any hard copy of the application form. The candidates who are filling the Axis Bank Young Program 2019 application form have to pay the application fee of Rs. 500. The candidates who want to get admission in Axis Bank Young Banker Program Fee (Annual) will have to pay the course fee as given below. Those students who were able to clear the aptitude test successfully will be informed about the personal interview by the mean of SMS or E-mail. Axis Bank gives Provisional Letter of Appointment to all the candidates who successfully joins the Young Banker Program. The students who enrol in the program have to maintain the minimum attendance of 90%. After joining the job at Axis Bank, there will be a probation of 6 months. First Trimester: It will comprise of Basics of Banking, IT in Banking, Business communication, Managerial Economics, Business Mathematics and Statistics, Accounting, General Management. Third Trimester: It will comprise Financial Planning, Foreign Exchange, Credit Risk Management, Retail Banking, Treasury Management, Recovery Management, Business Analytics. Fourth Trimester: Learning will be on the job and will be in the form of the Internship and Project work. Stipend: Young Bankers will get a monthly stipend of Rs.5000 during the period of their studies i.e. for the first 9 months in order to meet the out of pocket expenses. During the time of their internship i.e. last 3 months, candidates will get a stipend of Rs.12000 per month as their living expenses. Insurance: During the duration of the course, young bankers will be covered by medical insurance of Rs.1,00,000. Placement and Salary: On successful completion of the Young Baker Program, candidates will be absorbed in Axis Bank as an Assistant Manager at a gross CTC of Rs.4.12 Lacs. Duration: The total time allotted for the aptitude test is 2 hours. Type of Questions: The examination will have multiple choice questions and a specific time is allotted to a specific module, which cannot be carried forward to the next module. Negative Marking: There is no provision of negative marking in the examination, so students can attempt any number of questions they want to. Candidates cannot review a question once it has been answered. Second Stage of entrance test: Axis bank can conduct a second stage of entrance examination in case bank thinks that the second stage of examination is required. The Examination will be divided into 4 modules and candidates need to attempt each section within a specific time allotted to that particular module.